In a medium bowl, lightly whisk eggs with oil. Add the ground almonds and coconut flour, salt, kaffir lime and baking soda and stir until smooth. If the mixture is too wet, add more ground almonds. If it’s too dry, add some water, a spoonful at a time. Let mixture stand for 20 minutes so the flours absorbs liquid. In a frying pan heat the oil on a medium heat. fry the Shitake mushrooms (if fresh, until they soften), then add the garlic and toss for a minute. remove from the heat and mix in the bamboo shoots and spring onion, just to warm them through. Add the roasted squash to the cooled pan and mix everything into a lumpy mash. Season to taste and set aside to cool slightly. In a medium sized bowl, combine all the filling ingredients and mix very well. Prepare a plate or tray brushed with a little oil, to place the assembled dumplings on. 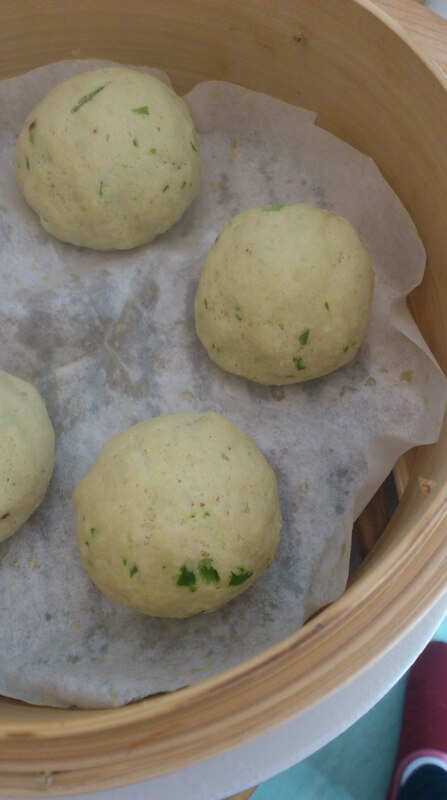 With wet hands, roll some dumpling mixture between your palms into a ball about the size of a cherry tomato. Now, using your thumb, press into the ball and start flattening it out into your palm. Place a teaspoon of filling (veg or meat) in the middle of the flattened ball, then start folding the sides of the dough in to cover the filling. 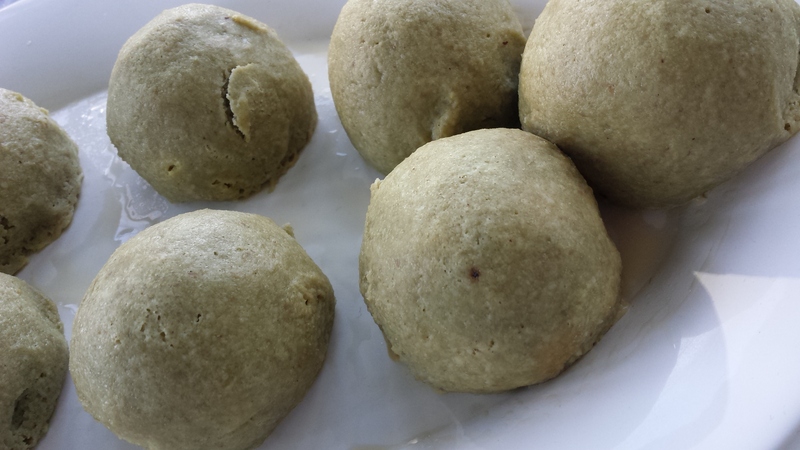 Seal the dough back into a ball and roll it again to re-shape into a ball. Place the stuffed dumpling on the oiled plate. Repeat this stage until you run out of dumpling dough and filling. Steaming: If you don’t have bamboo steaming baskets, place a small heatproof bowl upside-down in a deep saucepan (that has a lid) and place a lightly oiled plate on top of the bowl, then pour hot water half way up the bowl and bring back to a simmer. If you have steaming baskets, bring water to a boil in a suitably sized saucepan. Prepare about 5 greaseproof paper linings for your baskets and oil them as you go. Place the dumplings in your baskets or on the plate in the saucepan and steam for 4min (vegetarian filling) or 6-10min (for the meat filling). Try one to see if it’s cooked through and the filling is piping hot. Serve immediately accompanied with the Asian Dipping Sauce (recipe below) or in and asian broth. Combine all the ingredients in a medium bowl and whisk well until the honey has dissolved (this can also be done in a blender or with a hand held blitzer). Hold back a few chilli slices to decorate. Transfer into a serving bowl and decorate with the reserved chilli flakes. Optional 01 – One roasted chicken breast, shredded into strippes OR one grilled salmon filet, flaked. Both seasoned as you like. Place the dried shitake mushrooms in a small bowl and cover with boiling water. set aside for a few minutes. Using a peeler, peel both courgettes in long ribbons over a large bowl. Continue around the courgette until you reach the core which can be discarded. Drain the mushrooms and slice into thin slices. Prepare a chopping board on your working area and arrange the chopped fruit, vegetables and herbs (and meat or fish if using) in separate bowls, ready for assembly. It will be good to have your serving plate/tray ready as well. 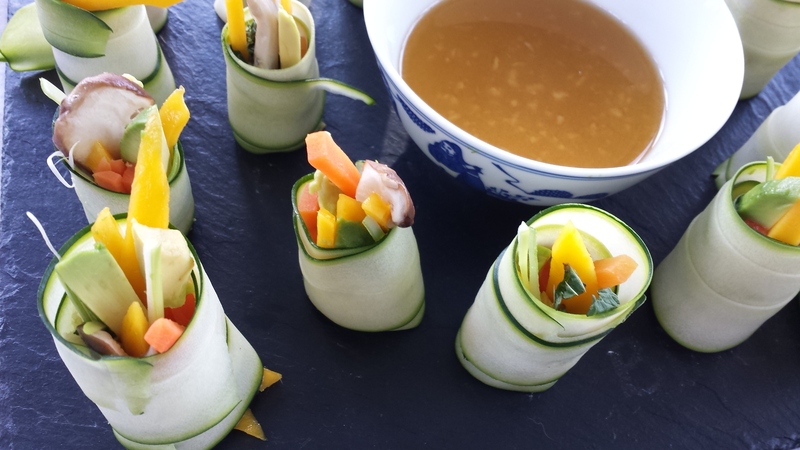 Take two courgette ribbons and place them one above the other with a good overlap, then in one end of the ribbons place a few carrot matchsticks, a mushroom strip, mango and avocado slices, meat or fish if using and sprinkle a pinch of herbs. Make sure the filling is placed parallel with the bottom of the ribbon. It doesn’t matter if the filling comes over the top of the ribbon. 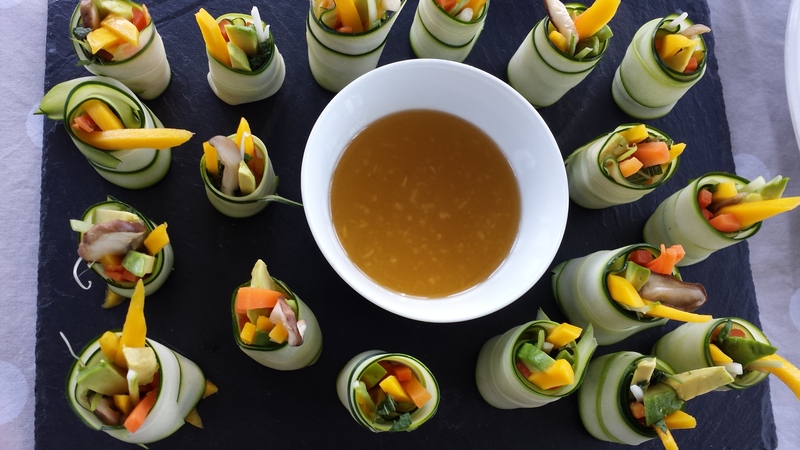 Carefully roll the courgette ribbons around the filling and stand it up on the level bottom end, and onto your serving plate. Repeat steps 5 and 6 until you have used up all the ingredients. Serve with the Asian Dipping Sauce. Can be made a few hours in advance and refrigerated. The last recipe in the workshop was the White Forest Muffins which I published in this blog before.